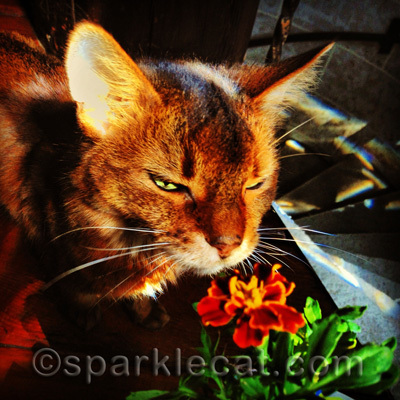 If you are one of my Facebook fans, or if you follow my human on Instagram, you may have already seen this photo of me checking out the tiny marigold plant my human brought home from some event she attended. Note the use of effects in an attempt to cover up how cruddy the photo is. She planted it in the backyard. Surprisingly, it is still alive. 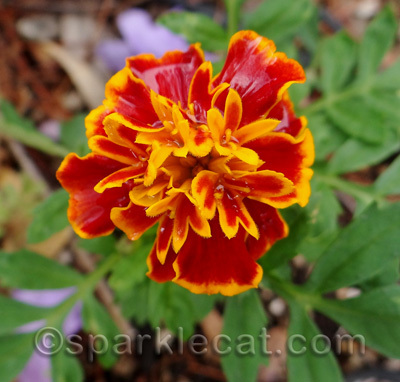 She took home this marigold because she heard it is good at repelling pests… and she thought it might help protect more valuable greenery, like the little nip seedling. And guess what? That little nip plant is an extension of last year’s plant! Remember what an awful time I had getting it started because my human kept letting the gardeners rip it out? Well, it is huge now! My human tries not to let it go to seed and she just removed a bunch of budding stems. So that meant just one thing… a fresh nip party! With the inevitable party crasher. 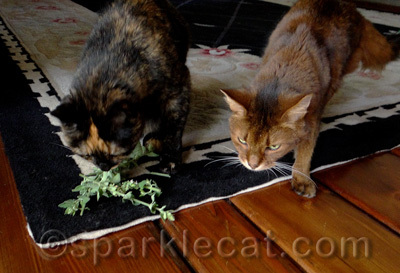 Ooooh, we LOVE catnip here too! I’m finding all these little plants popping up here and there in our garden–what a GREAT surprise. The only problem is that I have to put tomato cages around them because Hobbes likes to lay on the plants and smoosh them. 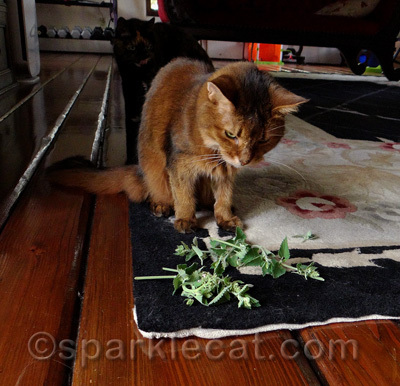 We get our fresh Nip in individual leafs scaterred around so nokitty can take them all. Sometimes it requires separate rooms! Oh my CAT. The expression on your face is PROCELESS Sparkle. Binga, you and Faraday make quite the team! I love a good nip party. I’m on my way. You probably don’t want to hear this but it looks like there is enough to share. You’re very lucky to have home-grown nip. My mom grows a container in the back yard, but I don’t get a nip-buzz so it’s just a pretty plant. Ours is flowering now. One of these days maybe we’ll convince Mom Paula to plant us some fresh nip! Once it gets started, nip can really take over. It needs to be that strong with all the kitties nomming on it. We think your mom is pretty talented, and her recent comments had us laughing. Although we can’t really tell what her drawing abilities are, she has a wicked tongue and is a funny writer. So, kudos to her! Looks like plenty of nip for all of you out there! Hope the flower keeps pests and gardeners away from your nip plant! Our Mom got a package of seeds and guess what? Sparkle that’s a start to a garden! we’re taking this as an invite to a nip party. Glogirly is useless with growing stuff. Except she can make orange furry stuff grow like a WEED! Pawty at Sparkle’s house!!!! Looks like your nip plant is taking over like all plants in the mint family. I don’t like the nip unless it’s dried cos we didn’t have fresh nip in the hood. 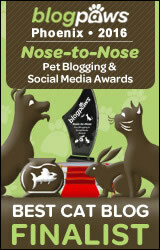 I’ve nominated you and your blog post about 4 times now. Best of luck. Woo Woo! Fresh stuff huh? That’s probably the very BEST and just think, it’s right there in YOUR garden! Fresh catnip that’s the best. Now that’s one of my favorite greens Sparkle! your human did an amazing job with the catnip! Mine killed mine! MOL! 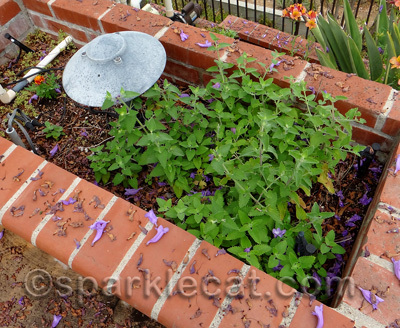 we keep trying to get our mom to plant some nip, but no luck yet…. ENJOY! Our nip plant is looking pretty sad. Mom moved it to another spot in the hope that it will start to thrive again. I’ve never had fresh nip. My old bro Eddie had some once and he went mental, so my mom though it would be a good idea to stick with the dried. I’ve probably told you that before (but I am getting on in years). Wish our mom would plant some fresh nip for us! She doesn’t know where to get the seeds she claims. 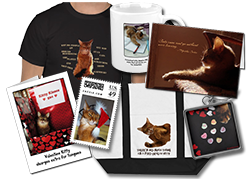 Nip Pawty..I am so there! Ohhh nip. We LOVE the nip here. Sparkle, our nip didn’t even come back this year. 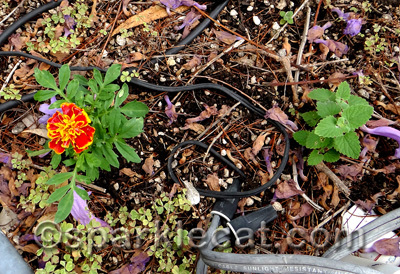 Proving our human is beyond help or hope as a gardener! Oh my dear whiskered friend your mommy is mighty pretty, please tell her I am glad I finally saw her. I am glad she is also gardening…sort of :). Sparkle I’m rolling in nip heaven right now….i have never had fresh nip…I think I need a new assistant with a green thumb. Did we hear the magic words nip and pawty? We’re teleporting over to test it for you. With all the rain we have had, our nip plant is getting huge. The marigold is really pretty and they are supposed to keep bugs away. Hope it protects the nip plant. Hope all of you have a super day. I’m on my way to join you in your nip party!! !